Screen Rooms, Cornelius, NC | G&S Contracting, Inc.
Screen rooms provide maximum enjoyment for outdoor living, but give you extra protection from bugs and harsh weather in Cornelius, NC. Screen Rooms in Cornelius – We all love the idea of grilling out on the patio and enjoying family dinners while watching the sunset. In reality, we often get driven back inside by insects and wind, which can become bothersome while trying to enjoy a relaxing meal together. Screen rooms are the ideal solution to provide maximum enjoyment for outdoor living, but give you extra protection from bugs and harsh weather. You can still feel like you are outdoors, but without dealing with the irritations that come with being outdoors. 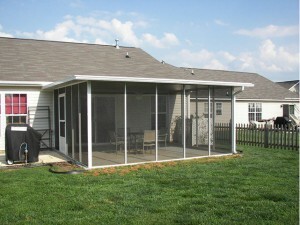 At G&S Contracting, we are experts in screen room construction. We place a high priority on quality construction, which has served us well throughout the years. Our customers love the high-quality results they get from working with us and the attentive service we provide during the construction process. We have been in business for 39 years and have an A+ rating with the Better Business Bureau, which shows our customers’ satisfaction with our work. We know the Cornelius, NC area has a need for screen rooms, and we would love to get you started on plans for your upgrade today!